St. Louis, MO: This photo of President Harry S. Truman laughing as he holds an early edition of the Chicago Tribune for Nov. 4th 1948, was taken by United Press staff photographer Frank Cancellare. The newspaper whose headline jumped to an erroneous conclusion as early election returns came in, was shown to HST as he stopped here during his victorious return trip to Washington, D.C.
Harry S. Truman became the 33rd President of the United States on April 12, 1945, after the death of Franklin D. Roosevelt (1882–1945). After serving three years as President, fulfilling FDR’s term, Truman (1884–1972), a Democrat, defeated Republican Thomas E. Dewey (1902–1971), the Governor of New York, in the 1948 United States Presidential election. Truman received 303 electoral votes to Dewey’s 189. The popular vote was approximately 24,000,000 for Truman and 22,000,000 for Dewey. This was extraordinary because it was widely predicted, almost expected, that Dewey would win the election. Truman’s popularity and approval rate were low. Truman’s barnstorming and a fervent whistle-stop tour helped him win the election. Frank Cancellare’s well-known photo was made two days after election day, Tuesday, November 2, 1948. Truman, was traveling on the Presidential train, the Ferdinand Magellan, a “Pullman Company observation car that served as Presidential Rail Car, U.S. Number 1 from 1943 until 1958.” Truman was returning from his home in Independence, Missouri through Kansas City to Washington D.C. During a brief stop in St. Louis, as he was thanking his supporters from the rear observation platform, the newspaper was handed to him, he laughed and held it up, the crowd roared. A few press photographers, including Frank Cancellare, were also on Truman’s train. Cancellare got off the train, went to the back and into the crowd and captured this now iconic image. (A less cropped version of this image can be seen on Getty Images. Apparently W. Eugene Smith made a similar photo.) Truman was holding the Chicago Daily Tribune, from November 3, 1948. Apparently 150,000 copies were printed, and a factor in the inaccurate headline was that the paper was printed earlier than usual because of a printer’s strike. The photo was made at the St. Louis Union Station. The beautiful Union Station opened in 1894 and was the largest train station. In the 1970s it became a National Historic Landmark, and in the 1980s it became a “hotel, shopping center, and entertainment complex.” In the future it might be “a top tier family friendly destination boasting a one of a kind aquarium, a 200 foot Ferris wheel and many other unforgettable family attractions,” to quote from Union Station’s website. 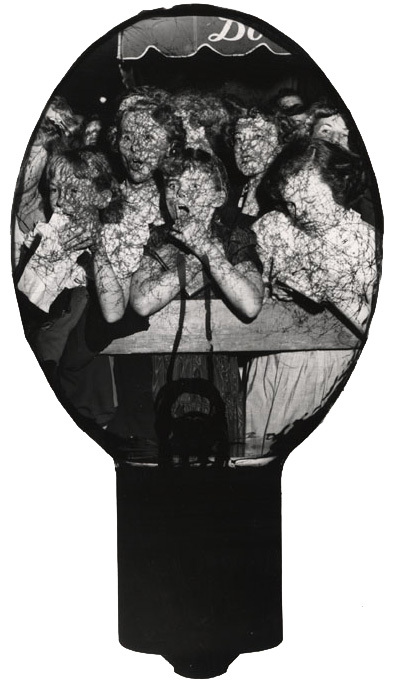 Frank Cancellare, born in Brooklyn, began his career in photography when, at the age of eighteen, he worked as a “squeegee boy” in the darkrooms of Acme Newspictures, in New York City. He was a professional photographer for over 50 years, and worked for Acme Newspictures, United Press and United Press International. He photographed the Burma Road during World War Two. He covered many Presidents including Franklin D. Roosevelt, Harry S. Truman, Dwight D. Eisenhower, John F. Kennedy, Lyndon B. Johnson, Richard Nixon, Gerald Ford, and Jimmy Carter. He was in Dallas on November 22, 1963, covering Kennedy when he was assassinated. Colleagues attributed Mr. Cancellare’s skill to his early training with the old Speed Graphic cameras. These cumbersome devices had to be reloaded after each shot. There being few second chances in such a game, the convention was to get one usable picture “in the bag” and then wait for something memorable to happen. Success depended on alertness, stamina and a quick eye. Combined with the brashness needed in a profession as competitive as Mr. Cancellare’s, the Speed Graphic taught many useful lessons. As expressed by Mr. Cancellare, one of these was that “as soon as you get something you want, say, ‘Thank you,’ and the whole thing breaks up and you’re the only one with the picture.” Washington Post, “Frank Cancellare, Ex-UPI Photographer, Dies,” By J.Y. Smith, July 16, 1985. Frank Cancellare and Weegee, very early in their careers, worked as “squeegee boys” in the darkrooms of Acme Newspictures in New York City. Perhaps coincidentally, they both also had a pair of photos in an exhibition at MoMA, in 1949. “The Exact Instant,” (February 8 – May 1, 1949), was an exhibition of American news photography and featured over 300 photos. The exhibition was “directed” by Edward Steichen (1879–1973), the assistant was photographer Homer Page (1918-1985), and the installation was designed by Rene d’Harnoncourt (1901–1968). One of Weegee’s photos was in a section titled “Fire, Floods, etc.” from the MoMA checklist: “Weegee, from his book Naked City: Mother and daughter look up hopelessly as another daughter and her baby burn to death in tenement fire, Brooklyn, December 1939. The photo is also known as “‘I Cried When I Took This Picture,’ Ms. Henrietta Torres and Her Daughter Ada Watch as Another Daughter and Her Son Die in Fire,” December 15, 1939. And in the “People” section was: “Weegee, from his book ‘Naked City’: ‘Tenement Penthouse’ – children sleep on fire escape.” Also known as: [Tenement sleeping during heat spell, Lower East Side, New York], May 22, 1941. One of Cancellare’s photos was in a section titled “Faces,” from the MoMA checklist: “Frank Cancellare, Acme: George E. Allen testifying before a Senate committee, Feb. 1946.” And another photo was in the “Politics” section: “Frank Cancellare, Acme: John L. Lewis reading newspaper at time of Federal injunction restraining miners’ work stoppage, Nov. 1946.” Fittingly it is a photo of a person reading a newspaper. This entry was posted in Fans in a Flashbulb and tagged 1948, Frank Cancellare, Harry S. Truman, LIFE, Life Magazine, President, press photography, St. Louis, Thomas E. Dewey, United Press International. Bookmark the permalink. This is obviously NOT “a less cropped” version!